The Natural Learning Initiative at College of Design, NC State University offered a one-day symposium, Healthy Early Childhood Outdoor Learning Environments, to early childhood professionals within and close to the Triangle Area. The goal of the symposium was to raise awareness about the role of the outdoors for early childhood healthy development and offer innovative ideas and concepts for participants to implement. 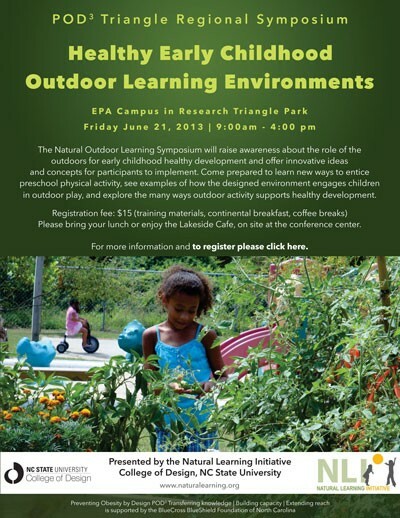 The symposium explored ideas on how to design, plan, and manage the outdoor environment for early childhood through plenary presentations, hands-on sessions, and tours of the POD3 Lab Site, First Environments Early Learning Center. Robin Moore and Nilda Cosco. Welcome & Introduction/The Benefits of Connecting Children to Nature. Jesse Turner. Best Practices of Outdoor Learning Environments. Michele Rivest. Finding OLE Resources Through Community Engagement, Bird and Butterfly Wildlife Gardens, Brighten a Corner Garden Plan,Bird and Butterfly Garden. Betsy Thigpen. Take Those Babies and Toddlers Outside!, Meeting Developmental Needs Outside. Jane Allen and Erica Pigage. Following Great Blue Herons. Jesse Turner and Brad Bieber. How to Plan and Implement Outdoor Learning Environments. Julie Murphy and Sarah Konradi. Creating Affordable Nature Play Settings, Affordable Settings and Elements Infosheet.